TUCSON, Ariz., Jan. 15, 2019 /PRNewswire/ -- Roche (SIX: RO, ROG; OTCQX: RHHBY) today announced the launch of its innovative uPath enterprise software for digital pathology. Offering a new standard of personalization for pathology workflows, the uPath enterprise software improves on the previous version, known as VENTANA Virtuoso. uPath software enhances the user experience by drastically decreasing image rendering times, integrating automated image analysis and improving efficiency by enabling an improved workflow for sharing cases between pathologists. To aid in the development of uPath software, Roche acquired the Leeds Virtual Microscope (LVM) technology from the University of Leeds, U.K., and the Leeds Teaching Hospitals NHS Trust, U.K. With this technology, pathologists can diagnose a patient case more quickly by viewing all slides in a case in a single seamless view, as well as viewing all available patient information simultaneously. Multiple slides appear on a canvas-like display, enabling pathologists to move seamlessly between hematoxylin and eosin (H&E), immunohistochemistry (IHC) and special stains in a single view, which is not possible with a standard microscope. The LVM technology operates on displays that range from laptops to ultra-high definition Powerwalls, to transform pathologists' ability to diagnose disease. 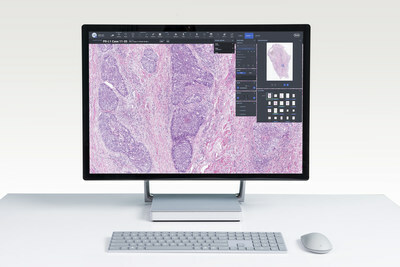 "With this launch, we are able to deliver an improved digital pathology experience consisting of the VENTANA DP 200 slide scanner and uPath software, which are the foundation to further enrich our portfolio of automated clinical algorithms for pathologists," said Jill German, Head of Roche Tissue Diagnostics. "We're excited to offer pathology labs a high-quality solution to help improve workflow efficiencies, accuracy and precision tools. This launch is another major milestone in our commitment to the advancement of patient care through digital pathology, empowering pathologists to deliver next-level personalized healthcare solutions." The innovative design of the uPath software integrates powerful imaging and analysis tools for more efficient workflow. It enables patient case assignment and seamless access to share and/or request a second opinion, all on a single screen. Analyses, both automated and manual, and slide markups are easily managed in uPath's multi-slide viewer, while reporting features allow pathologists to aggregate notes, measurements and slide scoring into easy-to-share images or PDFs. This launch follows the March 2018 release of the VENTANA DP 200 slide scanner. 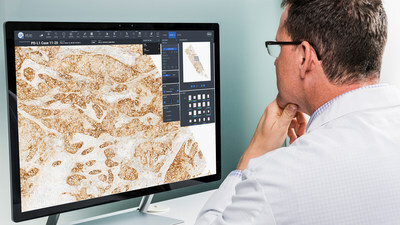 Together, Roche is delivering a new foundation of its digital pathology solution which will enable the development of artificial intelligence-based image analysis algorithms that can provide pathologists more tools to improve efficiency and precision.